Fish day | Walk with us! It is a very popular dish around here. 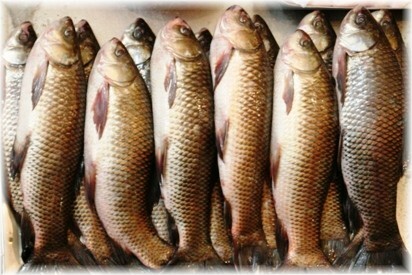 More fish is served than chicken or any other kind of meat. 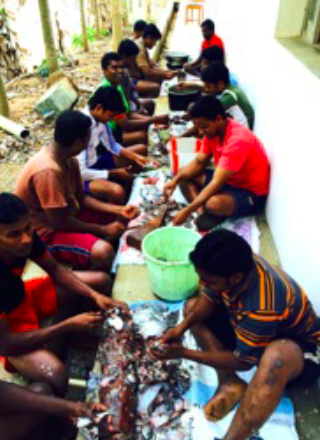 A fair number of our SCJs come from fishing villages in Kerala and naturally have a taste for fish. Here in Eluru we are about 2 1/2 hours from the coast so I can’t say the villages around here hold many seafaring men. However, I suspect fish may be the least costly source of protein in the local diet. When Frs. Mariano and Jojoppa returned yesterday afternoon I asked them what time they left as the night before I was told the trip was planned for a 2:00 AM departure. I thought my watch said 4:00 AM when the old diesel jeep cranked up outside my window. Even if I had been in a deep sleep the racket would have pulled me back to a conscious state. At any rate, the answer I got was 3:30 AM. The discrepancy in time may be my watch as I have a setting for Milwaukee time and local time. MKE time is 11 1/2 hour behind India’s one time zone. I asked Fr. Mariano about their trip. The road to the coast is not very good right now as a lot of it is under construction (don’t we know about that back home!). Although the traffic was light there was a lot of mist and fog along the way. At times, he said, they could hardly see 10 meters ahead (30 feet). The two of them managed to arrive in plenty of time to catch the boats. Although people plan on the boats coming in around 6:00 AM more often not they’ll be at least a half hour later. A lot depends on how good the fishing was, and I’m sure both the weather and currents and tides may have something to say about arrival time as well. About 2:00 PM the jeep came rumbling up our driveway with its horn a-blaring. The signal for: “All hands on deck.” The jeep was packed with three or four large styrofoam boxes containing the iced fish. When asked how many kilos he brought back, Fr. Mariano replied: Oh about 200 or maybe 250 kilos. That should last the community of 20 around two months. With their summer vacation coming in mid-March and the postulants leaving here around March 1st for a couple of weeks vacation before they have to report to the novitiate at Nambur I think this load may last a bit longer. Most of the outages are of a short duration of no more then 15 to 30 minutes. Freezers will keep stuff frozen for that duration. For longer times the house has a generator that seems to me can run the entire electrical needs of the community. We’ve used it a couple of time since I’ve been here. I haven’t figured out how, when or why the generator kicks in as most of the time it does not. My working theory is some outages are planned and our generator is fired up during these. I’ll have to ask for a better explanation. The fish cleaning party took place behind the kitchen. It took a little while to round up all the students but before too long music was a blaring and laughter and chatter could be heard even from the roof when I was up there to send my afternoon e-mails and journal/blog to the provincial office. As the fish cleaning party is a regular occurrence (about every two months) everyone had an idea of what he was supposed to be doing. Since some of the students do come from fishing villages they probably have done similar work, perhaps not on this scale, within their families. Keeping in mind that the 440 pounds of fish would be reduced in volume/weight as scaling and cleaning took place for a community of 20 at the full weight of 440 it amounts to 22 pounds of fish per person and about 1/3 of a pound per day. As I’ve said, it is the probably the chief source of protein. We were talking about the local diet at breakfast and comparing it to what we eat back home. I said: Americans would want more vegetables, especially green vegetables, than what is served in the house. Obviously lots of rice form a major source of calories in the diet. A cup of short-grain white rice has 242 calories that include 53 grams of carbohydrate and four grams of protein. Believe me, the students plates are piled with a lot more then a cup of rice as it is the mainstay of most meals. The students worked all afternoon before they could call it a day and put the 200-plus kilos of cleaned fish in the deep freezer for future use. They enjoyed the fruits of their labors at our evening meal. A small token of thanks showed up at the end of the meal in a dish of vanilla ice cream for all. That reminded both Fr. Mariano and Sebastian of Fr. Tom Garvey, SCJ, who holds a special place in the development of our Indian SCJ presence. I spoke about him earlier. His name came up because Tom was well known for his love of ice cream. He did not develop that taste here in India but brought it with him from the States for there too his love of ice cream, especially vanilla, was well known.